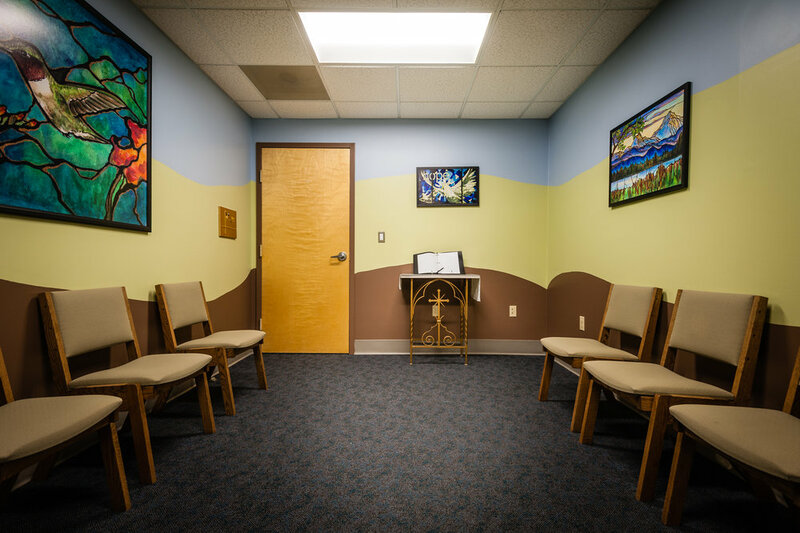 A small rectangular room off a main corridor houses the chapel at Franciscan Children’s in Brighton. Founded by Cardinal Richard J. Cushing and the Franciscan Missionaries of Mary with financial assistance from many benefactors, the hospital opened in 1949 to provide convalescent and later out-patient care for medically complex children. Today the hospital provides in and out-patient care as well as an educational facility for disabled children, a pediatric dental clinical, a rehabilitation program, psychiatric services, and a medical day care. It is Franciscan Hospital, many in the city say, that cares for children no other healthcare facilities want. The hospital’s Catholic founding is currently evident in the chapel’s Christian art and symbols. Chaplaincy Director Steve Murphy says these will likely soon be removed in an effort to make the space more inclusive. Muslim prayer rugs and texts sit on a shelf behind the door. A prayer request book (not a Bible) currently sits on a small altar at the front of the room. Visitors are invited to share their own thoughts or prayers in the book as they pass through. The Catholic Eucharist is housed in the tabernacle and available on request, often from staff members also trained as Eucharistic ministers through their parishes. The space moved to its current location from a large traditional Catholic chapel years ago, and Murphy hopes the chapel in a new building (currently being designed) will be larger, more beautiful, and accommodating of the facility's many pediatric visitors who come to outpatient appointments in wheelchairs. Catholic Mass takes place in this space on Mondays during the academic year and an interfaith prayer service on Thursdays.